In the previous post I talked about finding a unique photograph in a situation revisted by a photographer in our industry on a weekly basis. 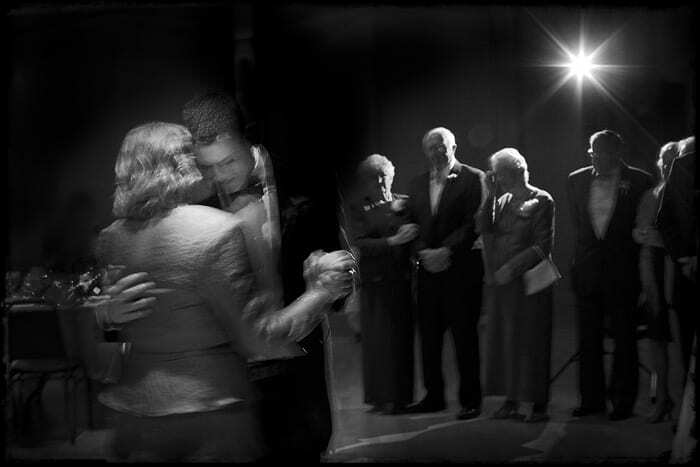 I document weddings for a living, so one might presume that I see a groom dance with his mother on a regular basis……you would be correct if that was your assumption. Bryan and Meg’s wedding in the lovely Adirondacks of New York had just such a moment. Bryan and his mother made their way to the dance floor and we started documenting the moments. If you know me, I love motion blur, slow shutter speeds, available light, etc…….all of the challenges and risks that I take that can yield results that are striking, undeniably unique, and keep me coming back for more. It’s not easy to photograph at a very slow shutter speed, but it’s well worth the risk. This photograph gives a feel and a moment that I look for no matter what I use for a camera setting. If you look closely, nothing in the photograph is sharp. I didn’t want it that way. I wanted to convey a feeling. This photograph contains the subject and the guests taking it all in. I am attracted to the warmth of Bryan and his mother and what made this image take another leap forward for me was the emotion conveyed by the grandmother in the background, clutching her husband’s arm. It’s these images, the reality, the non-fictionalized moments, that make this career path so rewarding for me.